The world-renowned Bates Motel was back in business in 1986’s Psycho III. Norman Bates had lost his mind again and he was doing what Mother wanted. But this time, Mother was not exactly Norman’s real mom. Bates had replaced Mother with her sister, Mrs. Emma Spool. 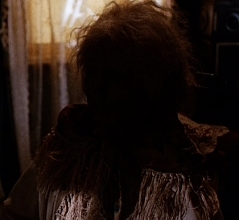 Mrs. Spool’s corpse now acted as a substitute for Mother Bates. Hitchcock’s Psycho is an undeniable classic and Psycho II (1983) is a worthy follow-up. For a third entry in a franchise, Psycho III is a solid movie (so is the next one, Psycho IV: The Beginning, for that matter). Towards the end of Part III, Norman not only has to deal with characters who have threatened to expose his secrets, but also his growing psychosis. Ultimately, he tried to silence the voices in his head. He did this by attacking the embalmed body of Mrs. Spool (a.k.a. Mother). Armed with a long knife, Bates went after the deceased but very creepy Mrs. Spool. Bates slashed away at her, dismembering her in the process. 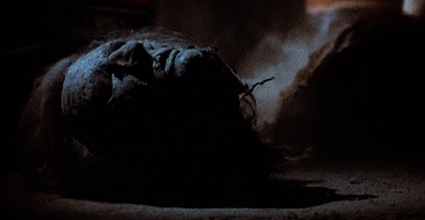 In the first few swings, Bates managed to decapitate Mrs. Spool’s corpse. Her head rolled away and came to rest in a patch of light. Upon seeing the severed head, I immediately thought of Michael Myers in Halloween 5. In this particular scene, Mrs. Spool’s head kind of looks like Big Neck Myers complete with nose appliance, strange hair and the rough features of the H5 mask. 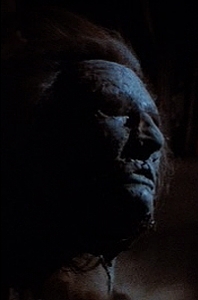 There is also at least one replica Myers mask that looks exactly like Mrs. Spool’s face. Oh Yeah thats right, look like mask old woman, Should be Unmask from him ! !